This is the website of the organization as discussed at the BIRMA gathering in April. The 50th Anniversary of the Vietnam War will be observed this November in Hilo. Click on title to view. 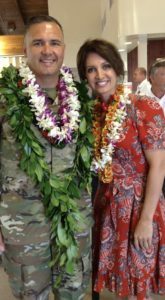 Our new U.S. Army Garrison Commander of the Pohakuloa Training Area is Lieut enant Colonel Christopher M. Marquez. We welcome him to The Big Island. The Change of Command Ceremony was on. June 1, 2016. They have two lovely twin girls. We look forward to having the family join us at our BIRMA meetings when available.